Adware.Plus-HD acts like a useful add-on which supposedly can enhance your online experience by displaying YouTube videos in their highest quality format available. However, we advise you to remove Adware.Plus-HD from your computer because it is classified as adware which might be privacy-invasive as well as show various advertisements all the time. This adware works with all the popular browsers which are Internet Explorer, Mozilla Firefox, and Google Chrome. As it is not very beneficial and definitely not as safe as it claims to be, we will help you remove Adware.Plus-HD from your computer. 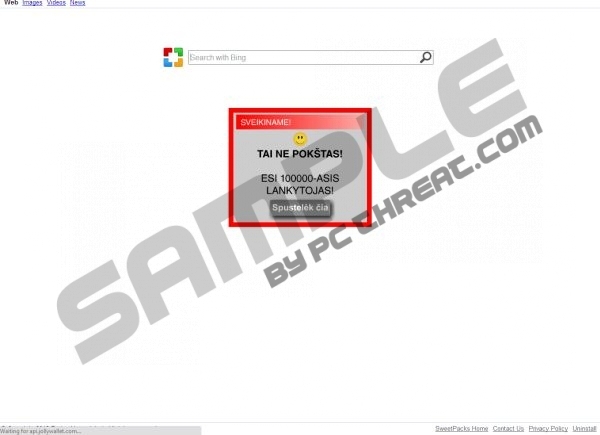 Adware.Plus-HD is published by Kimahri Software inc. and it usually comes bundled with SweetPacks Toolbar which changes your homepage and search engine provider to its own. Plus-HD adware usually gets into your computer when you are installing unreliable free software and do not select the advanced installation where you can unmark the unnecessary components. After it is infiltrated into your computer, you might start seeing annoying advertisements when browsing certain websites or you might even be redirected to some of them. These ads might include price comparison advertisements, coupons, pop-pups and pop-unders, banners as well as inline text or transitional ads. All these annoying advertisements will definitely interrupt your browsing activities, which is why you should remove Adware.Plus-HD as soon as possible. If you leave Adware.Plus-HD on your computer, there is a risk that you will be lead to corrupted websites because Plus-HD is not responsible for any third party websites, products, services or offers promoted in advertisements. It means that there is always a possibility that you will be redirected to the website with unknown content. If you want to keep your computer safe, you should remove Adware.plus-HD as soon as you can. Furthermore, there is another reason why you should not trust this unwanted program. It is known that it might access your data on all the websites including tabs and browsing activity. This information might be collected and used for commercial and other unfair purposes. If you do not remove Adware.Plus-HD, you will soon notice that your browser works slower and it takes more time to open a website. In addition to this, you might be redirected to some website whose content is unknown. If you are already convinced to remove Adware.Plus-HD from your computer, we advise you to delete it manually and then scan your system with a reliable antimalware tool because manual removal instructions might not help you to delete all the elements of adware. SpyHunter antimalware tool will definitely remove Adware.Plus-HD and will protect your computer from future threats. Open the Start menu and click Settings, then Control Panel. Select Control Panel and then Uninstall a program. Right-click on the program which you want to remove and select Uninstall. Right-click on the background and select All apps in the right corner of the window. Open Control Panel and then click Uninstall a program. Find the application which you want to delete and right-click it. If the plug-in still remains on your browser even after you have removed it via Control Panel, follow the instructions below to delete it from your browser manually. Press Alt+T to access Tools. Click Add-ons and then Extensions. Select the extension which you want to delete and click Remove. Remove Plus-HD from Toolbars and Extensions. Select Extensions and remove Plus-HD from the list. Quick & tested solution for Adware.Plus-HD removal. Facing Problem in removing Plus??????? Facing Problem in removing Plushd?????? ?